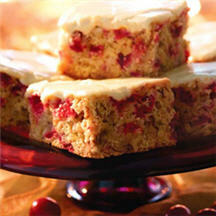 These easy bars are sure to become a favorite "go-to" recipe for fall and winter holiday parties and potlucks. Preheat oven to 350°F (175°C). Spray a 13x9x2-inch baking pan with non-stick cooking spray; set aside. Spread glaze on top of cooled bars. Cut into 18 (3x6-inch) pieces.